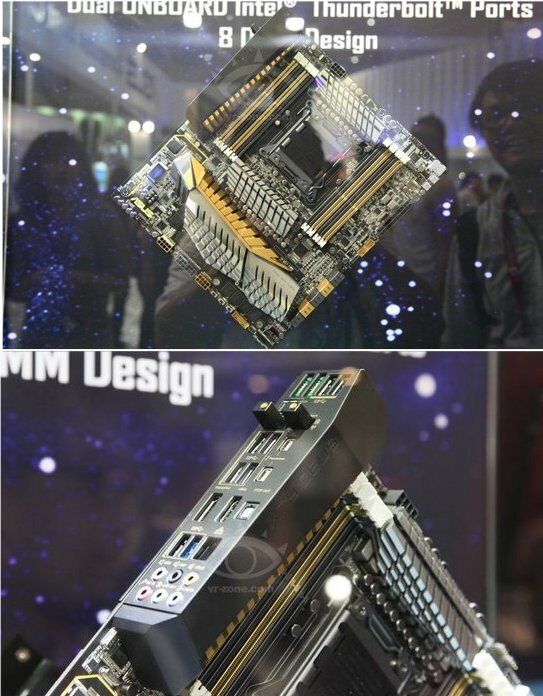 ASUS shows off its ZEUS motherboard concept at Computex. This prototype is quite unique because it integrates a Sandy Bridge-E HEDT motherboard and a dual-GPU graphics card on a single PCB. Full details at VR Zone, but it's uncertain if ZEUS will ever hit retail shelves. The LGA2011 socket is surrounded on all four sides by components that matter. To its north, is the 10-phase Digi+ VRM that powers the processor. To its east and west are a total of eight DDR3 DIMM slots, which can hold up to 128 GB of quad-channel DDR3 memory, beyond the 64 GB limit for unregistered DIMMs of SB-E HEDT platform. To its south are two sets of graphics card VRM areas, which power each of the two GPU systems. The two GPUs are directly wired to the two PCI-Express 3.0 x16 links of the processor, while the third PCI-Express 3.0 x8 link goes into driving other onboard components. At this point ASUS didn't reveal exactly which GPUs are behind that chunky heatsink, but we have a hunch that it's a pair of AMD Radeon HD 7970 (Tahiti XT) GPUs. What makes us doubly sure that these are AMD-made GPUs, is that NVIDIA does not recognize the Sandy Bridge-E HEDT platform as PCI-Express 3.0-compliant, something ASUS is stressing on, on the marketing poster of the ZEUS. Each GPU has its own set of memory, and draws power from a pair of 8-pin and 6-pin PCIe power connectors. The outputs of both the GPUs are given out as a mini-DP + Thunderbolt connector, a 2-port controller is driving the Thunderbolt links, apart from standard DisplayPort and HDMI.